Infinite Backlog: It's opposite day! I have two games to talk about: one that I should be paying (not Trackmania , actually) but am not and one that I am playing but really shouldn't be bothering with. Confused yet? Movie licensed games are almost always terrible. The reasons are many: incredibly strict release windows, overbearing property owners, developers chosen not for their ability but for being the cheapest and easiest to bully. The results are almost always the same and look a lot like Tron, which I played earlier this year. Every once in a while a good one sneaks out and unfortunately no one notices. Remember High Moon Studios? With Darkwatch, The Bourne Conspiracy and Transformers: War for Cybertron to their name I have come to expect solid is relatively quirky games out of them. In truth, I did not know that they did Transformer 3, the game of the movie that had everything worth seeing revealed in the trailers, when I added it to my list. I am relieved that they did, as the game is much better than it should be. War for Cybertron was a very good third person shooter first and then about the Transformers second. Transformers 3 is actually saddled with a movie this time so it is forced to be more character centered, but they change often enough and play differently enough that it still works. Having not seen the movies I do not know why Bumblebee doesn't speak English or what happened to Megatron or why Soundwave looks like an Escalade with sweet rims and a tricked out sound system (but that last one at last makes sense). But I do know that there are giant robots shooting one another, they have the correct people doing the voices that matter, and it is fun with very little effort on my part. It's not good, but it's fun. And now for something completely different. Deus Ex: Human Revolution is, of course, a very good game. It looks good, making fine use of my new card and proving the PC's still are where high end graphics live. It plays well, but it does not necessarily play the way that I want to play it. 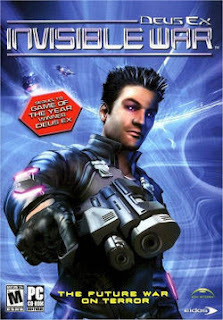 This is the first PC shooter that I have played in years, so just getting my head around mouse and keyboard controls again took quite a while. Once I remembered how to shoot people in the head while circle strafing it got better, but I still could not play the character that I wanted to play. Spoilers are a difficult thing to avoid, so I know ahead of time that the boss encounters favor fire power over stealth or eloquence, so from the very beginning I wanted to play a guy with big guns and a bad attitude. Regardless of personal skill and perc allocation, frontal assaults just don't work. I wanted to kick down doors and shoot people, not crawl through heating ducts and strangle them from behind. My last save has my characters cowering in an office, waiting for the guards to pass because I cannot kill them fast enough when an alarm is raised. This is not the game I want to play, it the game I am being allowed to play. Is the gaming scale of quality sliding and subjective? Of course it is, but when you slap the name 'Deus Ex' on a box it means something. Being 'good' and being 'fun' aren't always synonymous. I will continue to play both, and Human Revolution will improve once I get better guns and some body armor, but for out of the box enjoyment the movie licensed cash in is somehow coming out ahead.